Need some help? Call: 01788 576100 & speak to our sales team! How does Bluecode offer such amazing prices on our standard labels? 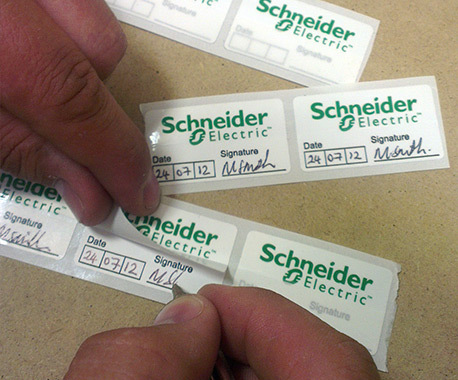 Well, our standard "off the shelf" labels range is manufactured in high volume keeping our costs down. These cost savings are then passed on to our lower usage customers thus offering a cost effective solution to your labelling requirements. Bluecode Labelling Technology manufacture "Write & Seal" Labels that allow you to write your required information a label with a standard bull point pen e.g. date, initials, serial no. etc before peeling the backing paper and sealing with its own attached clear strip. This protects the whole label from rubbing, abrasion, cleaning and solvents as well as ensuring that the information is not changed. Please contact us for more information regarding our "Write & Seal" Labels. For more information about the products & services BLUECODE Labelling Technology offer, please use our on-line contact form or why not call us on 01788 576100 where a member of our staff will be pleased to assist you.